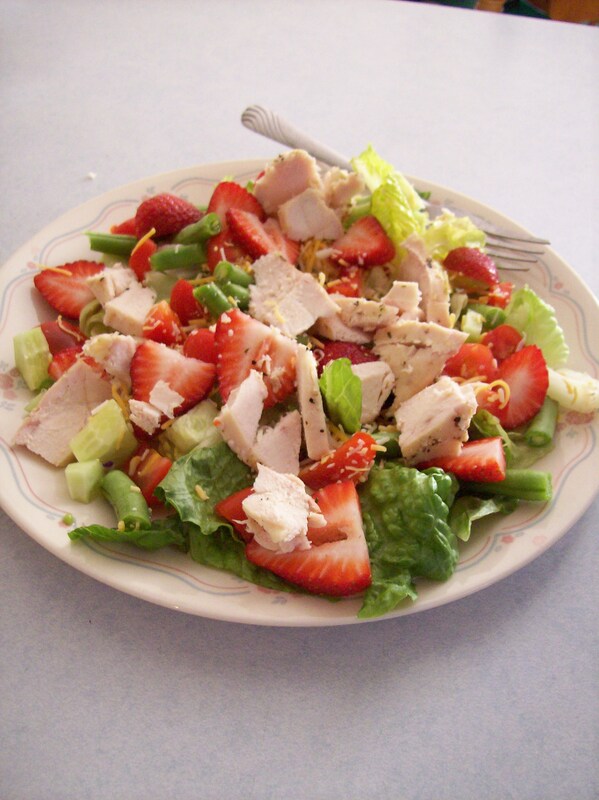 a Happy lunch: strawberries aren't just for shortcake! “Happiness is always a choice. You can’t wait for circumstances to get better. Today .. I’m happy I got up early again to do my 8 minute weights routine. 4 – count ’em – 4 days in a row! Oh how I wanted to hit the snooze button and sniggle back in .. but I didn’t! Today .. I’m happy that a cool front moved in and pushed away the 90F+ temps … back into the 70s we go. Yes! Today .. I’m happy that, in spite of the salt at the movies, my clothes are a little bit looser … yes! Today .. I’m happy that hubbs is due home from a trip. He’ll happily enjoy whatever supper I prepare and then watch his Tigers baseball while I read, blog or water my flowers … but I’ll be happy because he’s near. Today .. I’m happy because the kid has 2 days left of school .. and then he’s a Senior! How did that happen? Today I am happy that I am reading your blog. It is a positive way to start the day. This morning I’m happy to be reading my “go-to” subscriptions. I’m happy that daughter #1 had two good interviews. Today she hears if she gets called back…prayers, please. Happiness…one day at a time. I second Le Roy’s sentiment! What a happy post today! Hope WE get some cooler temps soon- it was almost 100 here yesterday. And I know what you mean about being happy when hubby is near – even though you’re doing different things! (( always happy when Hubbs is home .. even when we’re not together! )) I loved your post today about 69 years – wow – and so deserving of fresh pressed. OMGoodness…for Dianna, Happiness is being FP’d again! you pushed the 90+ temps on us…near 100 today. melting…. but still preferable to cold and snow. If you can figure out a way to bottle a substance the helps us ignore the snooze button and get out of bed to exercise, put me down for a case. What a great post. It left me with a smile on my face. Today I am happy because I got to meet an author who was awesome! And I’m also happy because I have one day left of work until a week’s vacation! Thanks for reminding me about the good parts of the day. Today I’m happy because I’m going to see my best friend who is due to have her second baby boy any minute and I am so excited for her I could burst. And I am happy to be working toward my best life with encouragement from positive “virtual” friends like you! I’m happy it’s Friday and that I’ve decided to buy a mini trampoline to keep fit. So much good stuff! I’m happy that you’re happy! And I’m jealous of your cooler temps!!! I agree with you, happiness is a choice. Not always easy. I also think it becomes a habit, if we practice it. So many small things bring a smile to my face. The little things are really important, and worth celebrating. Thank you for the encouragement to recognize the good things in life! I like this! Today, I am happy because all of my kids are home… and some extra ones too! Today, I’m happy that I got my cauliflower plants into the garden. Today, I’m happy that we set up a new porch swing on our deck.